Sri Harmandir Sahib, also know as the Golden Temple in Amritsar is the holiest shrine of the Sikh religion. 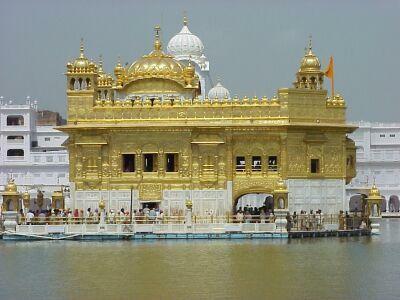 Also known as the Shri Darbar Shaib, it is in the center of the old part of Amritsar. 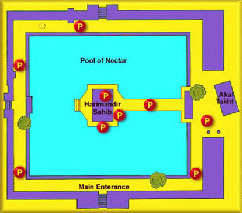 The Golden Temple sits on a rectangular platform, surrounded by a pool of water called the Amrit Sarovar from which the City is named. Click here for the Golden Temple History. The upper storey is gold plated, crowned with a dome (the Golden Dome) shaped like an inverted lotus. With the first light of dawn, the reflection of the temple in the tank gives an ethereal atmosphere to the complex. As the sun shifts, the temple presents myriad views, each magnificent and captivating. The Golden Dome (said to be glided with 100 kg of pure gold) is supposed to represent an inverted lotus flower, pointing back to earth to symbolize the Sikh´s concern with the problems of this world. The temple building has four entrances instead of the usual single entry. This is symbolic of the openness of Sikhism and indicates that followers of all faiths are allowed inside. The walls within are decorated with carved wooden panels and elaborate inlay work in silver and gold. The Adi Granth, compiled by Guru Arjan Dev, rests on a throne beneath a jewel-encrusted canopy. Priests conduct continuous recitation of verses from the holy book in 3-hour shifts. A complete reading of the text stakes 48 hours. The original copy of the Guru Granth Sahib is kept under pink shroud in the, Golden Temple during the day and at around 10 p.m. each day is ceremoniously returned to the Akal Takht (Sikh Parliament) building. The morning processional ceremony takes place at 4 a.m. in Summer and at 5 a.m. in Winter, when Sri Guru Granth Sahib is bought from Akal takhat Sahib in a procession to the Sanctum Sanctorum, which is washed with milk. The Akal Takht, next to the Golden Te mple, is the seat of the Shiromani Gurudwara Prabandhak Committee, the religious governing body of the Sikhs. The building of the Akal Takht was begun by Guru Arjan Dev and completed in 1609 by Guru Hargobind. If you miss the early morning or evening processions, the palanquin that bears the Adi Granth can be seen in the treasury room on the first floor of the Akal Takht. The palanquin is set with precious stones and has silver poles and a gold canopy. Shrines on the northern edge of the corridor are venerated as the 68 holy shrines of the Hindus. According to the teachings of Guru Arjan Dev, it was enough for the devout to visit these shrines and not visit all the original Hindu shrines which are spread all over the country. Many of these shrines have now been converted into a martyr's gallery showing the gruesome history of the Sikhs. Around the Parikrama, or pathway, are four rectangular cubicles where Granthis (priests) sit and recite the Granth Sahib. Pilgrims leave offerings at the steps, and can also get the holy book recited in their names for a donation. At the eastern end are two brick watchtowers called the Ramgarhia Minars, which were damaged during Operation Blue Star in 1984. The Guru-ka-langar or community canteen is a Sikh institution, which was started by Guru Amar Das in the 16th century. The practice of eating together encouraged shedding of inhibitions and the principle of equality. The community kitchen feeds up to 10,000 people in a day, free of charges. The food is normally chapattis and lentils. The Jubi tree, at the north western corner of the complex was planted some 450 year ago by the temple's first head priest. The old, gnarled tree is believed to have special powers and childless women tie strips of cloth on it to be blessed with sons. Marriage deals are also fixed under the tree, though this practice is disapproved by the temple authorities. Two flag staffs joined in the middle with the emblem of Guru Hargobind symbolise the dual aspects of Sikhism � religion and politics. Two swords of the emblem are enclosed in a circle with the inscription Ek Onkar (God is one). The Guru Ram Das and Guru Nanak hostels on one side of the complex offer free accommodation up to three nights for visitors. The Golden Temple is open to all. Pilgrims and visitors to the Golden Temple must remove their shoes and cover their heads before entering the precincts. No Smoking is allowed inside the whole temple area, photography is permitted only in/from the Prakarma , the marble pathway that surrounds the sacred pool. An English speaking guide is available at the information office near clock Tower that marks the temples main entrance. The information office has a number of interesting free publications.